Enigmacross is a professional acrostic puzzle development application. Use it to construct real acrostics just like the kind which appear in newspapers and magazines. With Enigmacross's many features, routine tasks and errors are eliminated, leaving you to concentrate on creating entertaining and original puzzles. This latest version of Enigmacross includes Crossdown Quotebank. Quotebank is an acrostic quotation database manager with which you can group any number of quotations into collections for quick browsing, comparison, searching, duplicating and dozens of other uses. Crossdown Cluebank, available separately, is a database for storing acrostic puzzle clues. It is fully integrated with Enigmacross, enabling you to bring up a list of clues to choose from for each acrostic word with one click of the mouse. With Enigmacross you can print acrostics in a variety of styles, and export puzzles in several popular graphic file formats for use with all word processors and desktop publishing software. You can deploy fully interactive acrostics to websites. You can generate puzzles as Adobe PDF files for distribution among other computer platforms, including Macintosh systems. 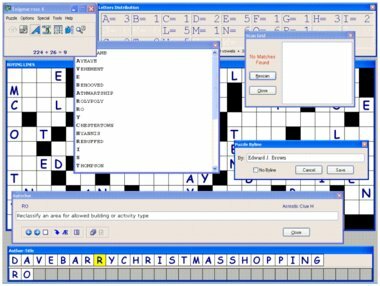 You can also generate standalone puzzle "player" game applications which can be run and solved on other Windows-based computers. Enigmacross also incorporates a basic solve mode so puzzle authors can test out their own creations, or just have a little fun! Enigmacross is developed by an acrostic puzzle professional for other acrostic puzzle professionals or serious amateurs. Enigmacross supports all versions of Windows from XP to Vista, and has an indexed, illustrated on-screen Help.